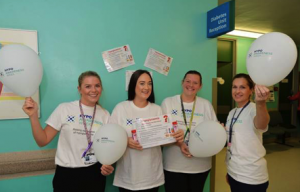 Raising awareness of hypoglycaemia is something staff take seriously all year round and they have co-ordinated awareness of the condition among co-workers to reduce numbers within the hospital. The four diabetes teams, led by a Project Lead, have a targeted and co-ordinated effort across the health board in managing and preventing hypoglycaemia. Rebecca Stevenson, a renal staff nurse and diabetes link nurse from Ward 32 at the Doncaster Royal Infirmary, has led significant changes since she began her role nine years ago. Changes on the ward have been introduced to help improve care every day through creative ideas. Examples of these include the Practice Injection Box which allows people with diabetes to practice injections on an injection pad. They also developed diabetes packs crammed full of information to support the patient’s education and they also created posters covering different aspects of diabetes care. The Queen Elizabeth the Queen Mother Hospital took part in this year’s Hypo Awareness week to raise awareness of the causes, symptoms and management of hypos in hospital. Walking all the wards with the Hypo Awareness t-shirts and asking staff about hypos. It is crucial that patients and healthcare professionals receive the correct education to recognise, treat and more importantly to prevent further hypos occurring. During Hypo Awareness Week the team’s main focus was encouraging people to think about the triggers of hypos. What caused it? What was different today? By keeping a note of when hypos occur, patients may gain a greater understanding of how to best manage their diabetes. Copies of ‘My Hypo Journal’ were made available as an example of how to make a record of hypos and prevent future episodes. The team documented their campaign using photos and arranged for a fun and educational event to take place every day across five days. 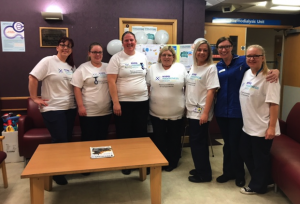 Activities included wearing t-shirts, sharing photos on social media, a hypo quiz, and a jelly baby themed competition which attracted 91 entries. A month-long audit was conducted on three of the renal wards to assess if the original audit was accurate and if so how could this be improved. Results demonstrated that hypoglycaemia was indeed common (93 episodes) and that treatment and documentation did not fit with the Trust policy. As a result of the data the team launched their campaign which involved prescribing two digestive biscuits to patients who had a bedtime glucose of <10mmols. It was a collaborative campaign involving not only the renal DSN but the renal dieticians and pharmacists. When they were re-audited it was found that hypoglycaemia had been reduced by almost two thirds just by this simple innovation. 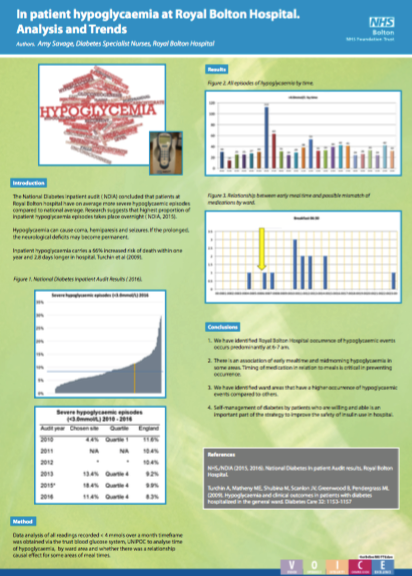 Last year, they composed and carried out a hospital-wide audit about hypoglycaemia. The results were clear in highlighting that hypos are treated differently by wards and staff members. All of the Adult Diabetes Inpatient Specialist team got involved in setting up and managing the stands. The stands were decorated with posters and balloons for more visibility. 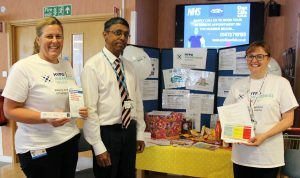 Diabetes companies provided posters, booklets, leaflets, hypo treatments and blood glucose monitors for the diabetes team to give to members of the public. The diabetes reps also helped manage the stand and disseminate information about hypoglycaemia. This year, the Queen Elizabeth Hospital’s diabetes team were determined to push the Hypo Awareness Week agenda. In addition to the stand, they also launched a hypo awareness poster competition which was extended by popular demand. 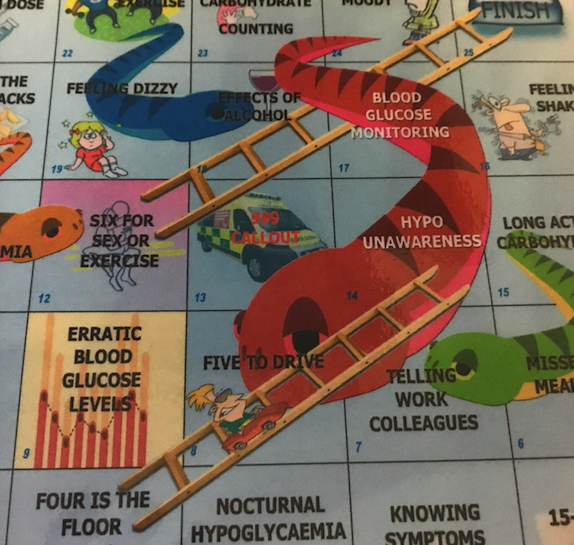 The team also created a hypo education flip chart, which was submitted to and published by the Journal of Diabetes Nursing. 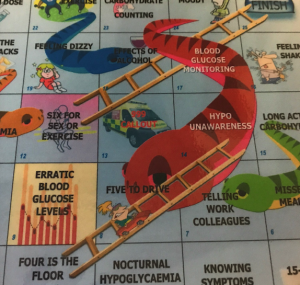 This was launched during Hypo Awareness Week on the wards. 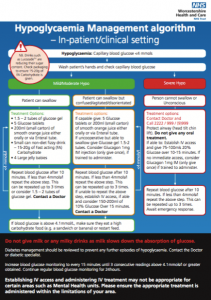 Staff and patient resources about hypoglycaemia were also created and a staff diabetes pocket guide was also launched. 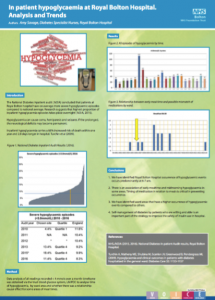 The National Diabetes Inpatient Audit ( NADIA) in 2015/16 concluded that patients at the Royal Bolton Hospital have, on average, more severe hypoglycaemic episodes when compared to the national average. Research suggested that the highest proportion of inpatient hypoglycaemia episodes took place overnight. To try to tackle the problem they took data analysis of all readings recorded < 4 mmols over a month timeframe. They were obtained via the Trust’s blood glucose system, UNIPOC, to analyse the time of the hypoglycaemia episode, the ward area and whether there was a relationship causal effect for some areas of meal times. They identified the Royal Bolton Hospital occurrence of hypoglycaemic events occurs predominantly at 6-7 am. They also found there was an association of early mealtime and mid-morning hypoglycaemia in some areas. Timing of medication in relation to meals was also critical in preventing occurrence. Sandwell and West Birmingham Hospital has a bed base of 850 patients and employs 7,500 people. It also has 38,000 admissions each year, of which one in three patients have diabetes and a third are insulin treated. NaDIA data in 2015/2016 highlighted poor hypoglycemia management in the Trust despite an overall improvement in hypoglycaemia elsewhere in UK. According to a recent survey, staff knowledge is poor in the hospital, with only 20 per cent aware of the Trust’s hypoglycemia guidelines and only 30 per cent were ‘somewhat confident’ in managing hypoglycaemia. The team used the issues raised to help identify objectives and solutions by implementing various procedures such as using a daily “hypoglycaemia email alert” system and introducing a monthly junior doctor insulin error/hypoglycaemia alert through the hospital IT system. The diabetes team at St. Helens and Knowsley took advantage of their split site environment to promote Hypo Awareness Week across their two different hospitals, St. Helens Hospital the outpatient site and Whiston Hospital, an acute inpatient site. 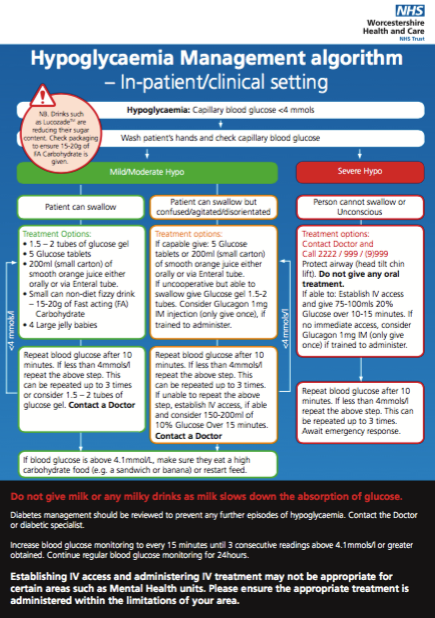 This approach allowed the team to hit hypo awareness using a ‘two-pronged’ effect – increasing awareness of hypos and lifestyle issues for patients, families and carers at the St. Helens site, while also promoting Trust standards and patient safety issues for their Trust acute inpatient staff at the Whiston site. The team already provide training for registered nurses in diabetes emergencies and have seen an improvement in hypoglycaemia management in ward areas. 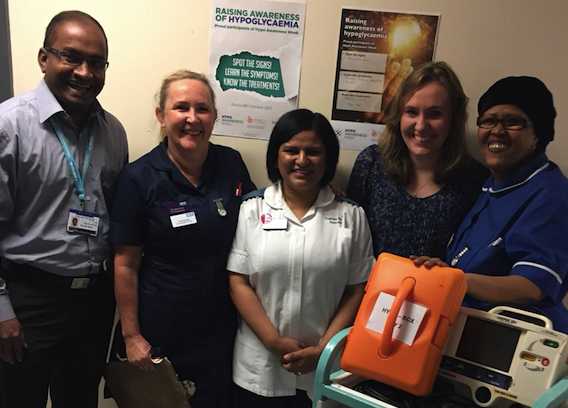 They used Hypo Awareness Week as an opportunity to provide toolbox style training to healthcare assistants. It highlighted a need for further diabetes training for healthcare assistants, leading to plans to extend the toolbox style approach. 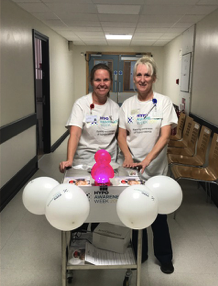 The diabetes specialist midwife had a Hypo Awareness Week stand within the maternity department, allowing people to visit the unit to ask questions and see further information. In addition they used the Stockport Diabetes Facebook page to explore hypoglycaemia all week. The page has 466 followers and therefore helped promote hypoglycaemia awareness among those people living with diabetes. This was the first time this Trust formally recognised Hypo Awareness Week and it was a busy one. They booked a stand in the hospital’s main entrance to catch patients, public and staff throughout the morning and lunch time period. They had created a visual, eye-catching stand, showcasing hypo treatments and the importance of following this up with long-acting carbohydrates. 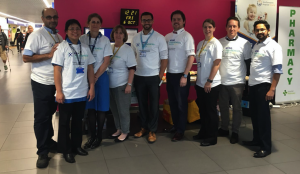 The whole of the diabetes team were involved including consultants, SPRs, the consultant pharmacist, specialist nurses and dietitian, and everyone spent time on the stand talking to people as they walked past. All areas of the Trust showed enthusiasm and wanted to be involved in the campaign, which was helpful as the Trust is the main provider of community nursing, therapy and mental health services across the county. These services include children and adult services in both community and in-patient settings, such as services for mental health, learning disabilities and physical health over six community hospital sites. 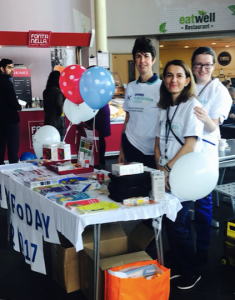 As a physical health and resuscitation team they work as part of the Learning and Development sector of the Trust, which meant they were in a prime position to launch Hypo Awareness Week. They personalised the Hypo Awareness Week packs to include their Trust Hypoglycaemic treatment algorithm. They recently created two algorithms to meet the needs of their community teams/own home settings and in-patient areas.